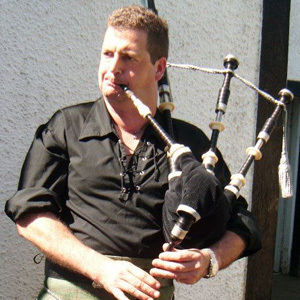 Professional Highland Bagpiper, Folk Musician and member of Celtic rock band ‘Killin Thyme’, Duncan MacKinnon has been playing the Highland Pipes for over 35 years. Initially taught by Hugh MacCallum – one of the world’s foremost piping exponents. Other teachers have included Pipe Major Allan Cameron, Fred Morrison and Dr Angus, Allan and Iain MacDonald. Duncan comes from a very musical back ground, both grandfathers played bagpipes and his mum is Mary Sandeman the singer ( Aneka ) he is also been a qualified music teacher in the central region schools and taught bagpipes and whistle for a number of years. 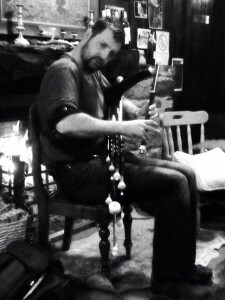 He has been actively involved in the folk music scene ever since being a member of the Central Region Schools Pipe band up until 1980 and has played a multitude of musical instruments during this time and is now playing full time with various musicians including Gill Hunter and renowned fiddler Archie McAllister. Duncan is willing to travel world wide to play. He has an ongoing commitment to the Folk Music festivals both in Scotland and Overseas. ‘Killin Thyme’ perform traditional and original tunes and songs as well as ceilidh music, with up to five members depending on the budget and occasion. Professional Highland Bagpiper, Folk Musician and member of celtic rock band Killin Thyme Duncan MacKinnon has been playing the Highland Pipes for over 35 years.